Now that I'm well into my twenties, I can't handle going out-out every single Friday and Saturday night quite like I used to, unless I want to be bed-ridden with a hideous hangover for the entirety of Sunday. Don't get me wrong, I love getting glammed up to the max for an evening spent sipping cocktails in beautiful bars and dancing the night away. But, I also love chilled nights in with a takeaway, Netflix and a load of luxurious products to pamper myself with. Any cosy night in our house has to include a great film or boxset marathon on our brand new UHD TV Panasonic, which makes it feel like we're actually at the cinema from the comfort of our sofa. I love it! At the moment, I'm totally wrapped up in the drama of Love Island - who isn't? - so that takes top priority on my itinerary for the evening. If reality TV isn't your thing, then I'm also working my way through past series of Game Of Thrones all over again, because I'm just obsessed. You also can't beat classics that you can watch time and time again, like Harry Potter, The Office or Friends. No night in would be complete without a hot bath and a mini pamper session. Whilst my bath is running, I'll use the Clinique Take The Day Off Cleansing Balm for a fuss-free double cleanse that removes all traces of makeup and impurities. It's not a particularly luxurious product, but it does a thorough job, doesn't irritate the skin whatsoever and saves you from wasting a really fancy cleanser when you're treating your skin with a mask afterwards. 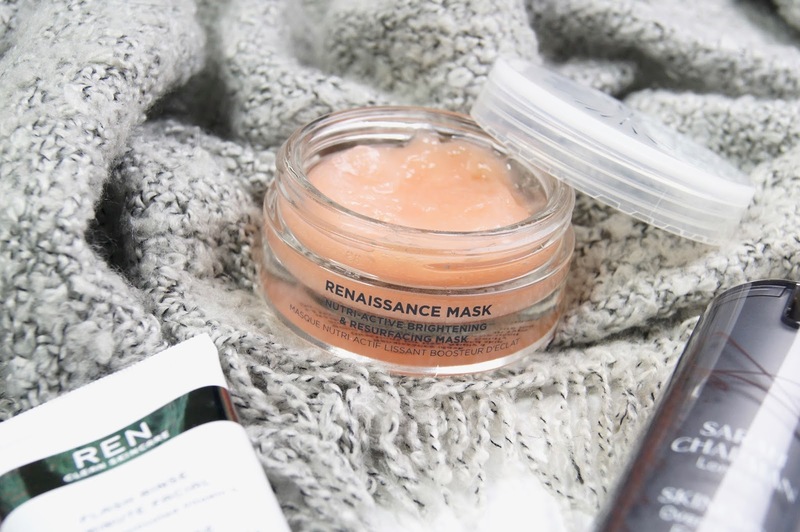 As always, the Oskia Renaissance Mask is my holy-grail for any pamper session. This is one of those masks that does it all and gives you instant gratification. If you're preening yourself the night before a special occasion, this is the mask you have to use. It gently exfoliates, brightens and drenches the skin in nourishing active ingredients, that leave the complexion so clear, smooth and radiant. Read my full review of the mask, for more details. For my bath, I love filling the tub with a concoction of bath bombs, oils, bubbles or salts, to really treat my skin and maximize the relaxation levels. My favourite combination of the moment, has to be the Lush Star Dust Bath Ballistic (basically the Christmas version of Butterball), which makes my bath sparkle and leaves my body feeling baby soft and the Aromatherapy Associates Relax Deep Bath Oil, which smells divine and helps me to switch off as soon as I breathe it in. 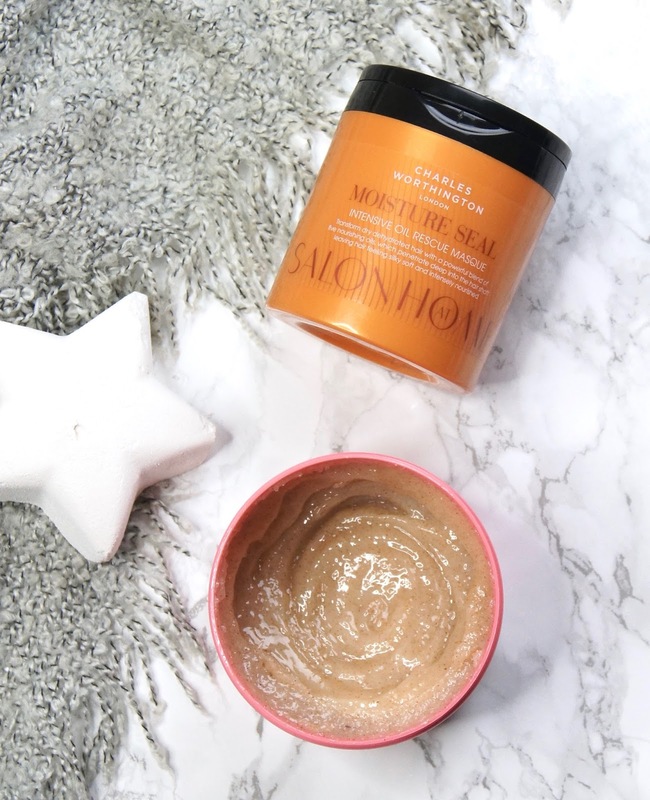 Whilst soaking in all that goodness, I like to slather on a generous helping of a hair mask, like the Charles Worthington Moisture Seal Intensive Oil Rescue Masque, which leaves my locks feeling like silk. As that gets to work, I'll give my body a thorough exfoliation with the Soap & Glory Flake Away Body Scrub, which is my favourite affordable scrub. I find a lot of scrubs barely make a difference to my skin, but this one really buffs away all my rough patches and also leaves the skin coated in a moisturising film after use, which I personally love. Plus, it smells heavenly. Once I'm out of the bath and have rinsed the mask out of my hair, I'll leave my barnet to dry naturally and move on to my skincare. 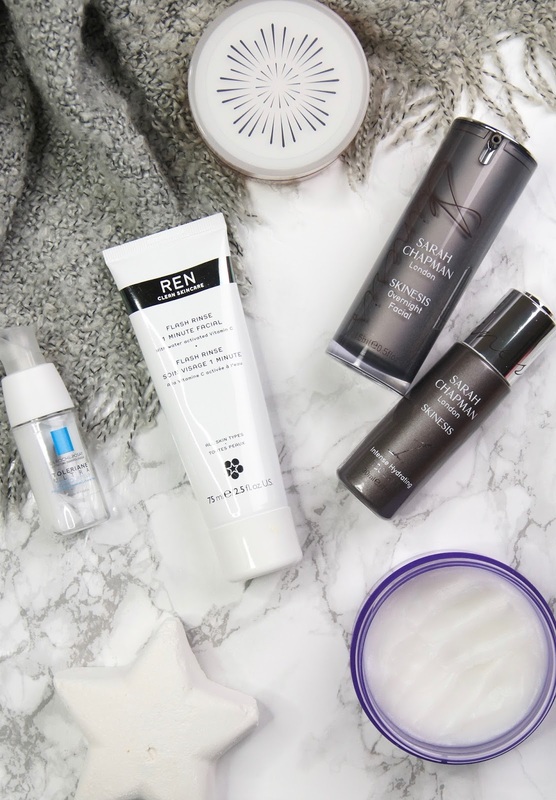 I'll use my usual REN Flash Rinse One Minute Facial, which leaves my skin feeling like porcelain and looking so refreshed (check out my full review). Next, I'll apply a drop of the Sarah Chapman Intense Hydrating Booster for my serum step, to give my thirsty skin a generous drink of hydration. Lately, I've been using the La Roche-Posay Toleriane Ultra Eye Contour Cream on my eyes, as they've been so irritated and sore and this is the only product that has helped them to recover. Finally, I'll finish off my skincare routine with the Sarah Chapman Overnight Facial. This silky elixir acts like an oil and offers the same levels of moisture, but it's non-greasy and sinks into the skin quickly to create a gorgeous glow (I've also written a full review of this product, too). 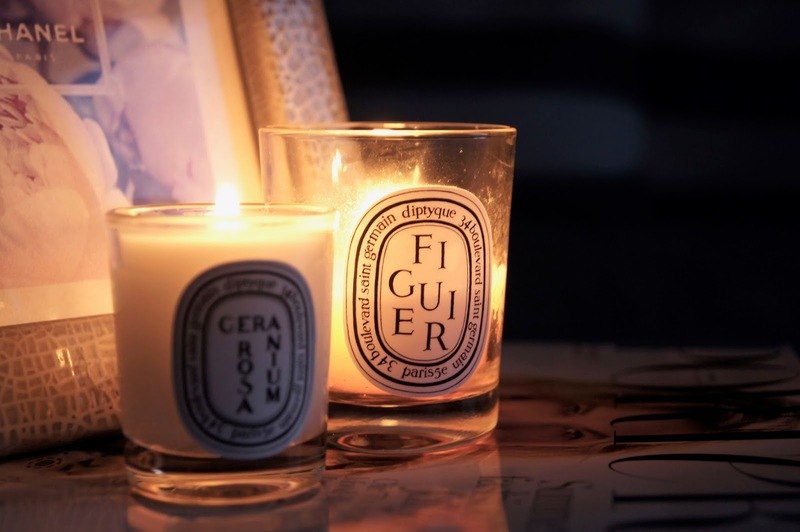 Once I'm ready to settle on the sofa, I'll put on my comfiest pieces of loungewear, pour myself a large glass of Rosé and light a few candles (I'm currently burning Diptyque Figuier, which is one of my all-time faves). How do you like to spend a cosy night in?